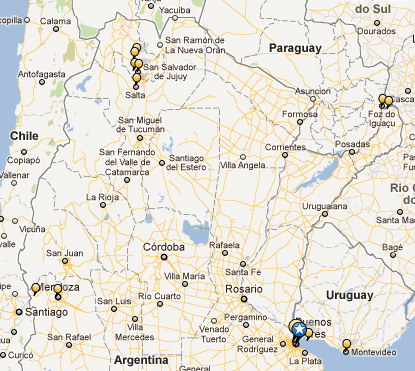 So we can tick off our travel list the 2 provinces of Argentina- Salta and Jujuy. The only luggage needed for our week escape! - Discovering how connected Northern Argentina is to Incan culture and the road leading from Salta to Machu Picchu in Peru! - Watching the colours change on the rocky coloured mountains- green, grey, brown, yellow, purple, red, pink, orange.. amazing! - Talking fluently in spanish to a local hippy who made for me, in front of me, some really cool rings! - Regularly sipping mate in the park, in the car, by a lake, walking down the street..
- Getting a parking fine in Jujuy town and going on the biggest mission to pay it off... it was only $30 pesos (US$7) so it wasn't so bad.. but effort.. gosh was it effort! - Purchasing earthen wears in Tilcara, a very historical mountain town full of Incan culture, Argentinian Indigenous people and lots of mountains, rocks and cactuses! - Staying in an amazing little Cabana with a fire crackling and smelling good and casting a romantic glow over the room as we fall to sleep. - Travelling to the North West of Argentina! 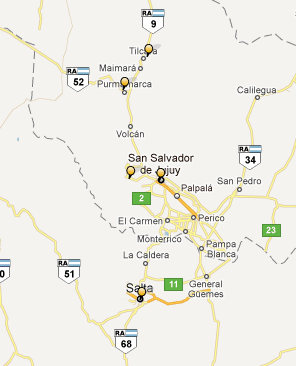 Salta and Jujuy (two 'states' or they call them 'provinces' of Argentina! IT WAS AWESOME! So that is our trip in a nutshell. I cannot say enough about how amazing our accommodation was in Tilcara (and if you are going to Salta, then Tilcara is a place to see!!) we stayed at 'Cerro Chico' which is like saying 'Little Mountain' I guess... but it was PERFECT! for US$70 a night... it was incredible!! you could easily pay more it was just so good!! I was totally our style but super comfortable, and the fireplace and amazing mountains surrounding us just made it! Our little salamander for our fire!! romantic! Let me highlight the route we took for you. We went to the North of Salta.. we only had really Tuesday to Friday (4 days with the car) starting in Salta and having to finish in Salta. We hired a car, which is TOTALLY the way you should do a trip in this amazing place!! Sure you can get comfy coaches everywhere.. but they are packed full with tourists and the drives are long. It was so nice having the freedom to take detours, stop where we want and where we stayed in Tilcara needed a car as well because we were 1-2kms on a little dirt road just out of the town centre (which was perfect). With only 4 days with the car, we chose to see the Northern areas of Salta and Jujuy... We were told that the South with Cafayate and Cuchi are incredible and the drive is supposed to be one of the most scenic ever, but we just didn't have the time- we would easily come back and do this in the future! But there is still so much of Argentina to experience- and SOOOO much of South America to explore! Monday Night we arrived in Salta, we went with a small car hiring company that was much much cheaper than Hertz car hire.. we paid for 400kms a day (we thought we were going to drive super far and forever) but we should have paid for 200kms a day which would have been MUCH cheaper!! but now we know and we learnt what to pay for next time. The car was ready and waiting for us at the airport in Salta and we navigated our own way to our little hostel in Salta (Yatasto Hostel). It was a friendly clean place which I thought was a little expensive for a hostel but it was good! In the car we get and off we go to Tilcara... we went the loooooonnngg winding scenic route around the back mountains of Salta to Jujuy, which took double the time then if we had gone on the freeway... It was nice, but too slow and long and winding...the best stuff/views started after Jujuy city! So go the freeway people! The roads were soooo narrow it was ridiculous! but it was sooo good driving, we hadn't driven since being in Australia which was 8 months ago...it was excellent! We made a lunch stop in a mountain town called 'Purmamaca' which is where the mountains were really spectacular. This town is at the foot of the famous 'Cerro de siete colores'/'Mountain of seven colours' we were there at 1pm.. and it was beautiful, but not AMAZING...the sun wasn't dancing on the mountain face, so the colours weren't as bold.. look at the difference in these photos! Morning is the time to see this little town ppl!! on the way to the salt flats! Anyway, we arrived in Tilcara at our amazing cabanas and relaxed.. we went into sleepy relaxed mode, lying in the sun, playing guitar, drinking mate... we went and explored the centre of Tilcara. We thought it was a 20 min drive to the salt plains from Tilcara.. but it was nearly 2 hours drive! and it was a SPECTACULAR drive... you would not want to do this in a tourist bus!! no way.. not around all those winding mountain roads up up up to 4100 mts and then down down down to the salt flats... it was incredibly picturesque! You have to go past the 7 coloured mountain in Purmamaca (glorious in the morning.. so many tourist buses, it is the best time to see it! ), and then up and up and up we drove! We drove next to cliffs that were so high and amazing... and then on the road we actually drove above those cliffs and was looking down on them!! Clever photography- perspective!! haha!! this is how we travel in Argentina! We then arrived at the salt flats.. was so quiet and no living thing. It had one building in the middle of the road.. not much good vibes going.. but we had fun, got out the car and took some very very fun photos. It is crazy to think that this whole area was once probably a huge natural salt lake! and now our world has changed so so much. We went back to Tilcara for lunch, walked through the Incan ruins. Ate llama steak for dinner, which tastes like beef really.. and that night we went to the main plaza (park/square) and bought some beautiful earthen/ceramic dishes, a jug...that are still used in Tilcara and are still made the same way, the same shape and design as the Incans did thousands of year ago. It is amazing how the Incan culture is alive and rich in this place- sure it is pushed a little more because of tourists... but when we saw the archaeological Incan findings and remains... it is the same.. amazing! Yay I'm in my shoe! My little husband on the bonnet of our car doing an Irish dance! Would not want to land on one of these! We checked out of Cerro Chico and left Tilcara not really knowing where we were going to stay that night or where we wanted to go. We hadn't pre booked this night just thinking we would make a plan as we drove, which is what we did. We read in lonely planet that there was a place called 'Termas de Reyes- Aguas Calientes' which is the Kings Thermals- Hot waters. It was about 15mins out of Jujuy town centre. You take a road off the main highway and it leads you into a natural, lush valley between green mountains. It was so relaxing and good, parking under a shady tree and spending a couple of hours drinking mate and swimming in the hot thermal waters from the mountains!! we laid in the sun like lizards, relaxed, swam.... our skin was amazing after being in this water!! I am so into natural thermal waters!! awesome- and not many people about, so it was very tranquil and not touristy! Leaving Jujuy around 11am.. we had left our car in a pay parking spot on the street and at been there 1 hour without buying a ticket.. so we got fined.. it SUCKED! Not knowing where we really were and the process in order to pay it.. we had to find the local municipality office to pay our fine.. the later we left it, it would get bigger, and we couldn't leave it to the car company to pay... so off we went with our bad spanish skills and actually got it all paid and done within an hour! amazing! we thought we would be in cues for HOURS waiting, or get lost and not be able to find the building. but it was success! Back in Salta we decided to stay our last night back at the Hostel Yatasto.. it was cheap and on a quiet street. we had lunch at a small mexican place which had THE BEST mexican we have had yet!! it was so good we went back there for dinner! simple and healthy and tasty and goood! haha. we also went to the Archaeological Mountain Museum in the main square of Salta which was a highlight!!! The Incan history is incredible! I had no idea of it's significance in Northern Argentina. We came face to face with a 15yr old girl mummy. She was a child sacrifice to the Incan God's where they choose the best looking, healthy and highly respected child (son or daughter of the chief most likely), take them on a pilgrimage to Maccu Picchu and back and then drug them up and bury them alive, fully adorned and buried with prized objects so that the Incan Gods would bless the people. It was a most honourable ritual, and one that I just can't understand. It was sad and looking into this 1000 yr old child's face, I had no words... it was so fascinating. This was a little girl, sacrificed for her people. The museum as a whole was amazing and explained everything really well! Even the little dolls and materials and pots that were buried with the children were perfectly preserved, the colours still so vibrant and the painting on the ceramics so clear, incredible. The car was picked up at 8:30pm that night. No problems, too easy. To the airport and then an easy flight (2hrs) back to Capital. A remis (a private taxi from Quilmes) home and it was great to be back. Another fabulous adventure for you guys! Something about South America, it's the flavour of the year i think.Ian's sister Paula there now, just finished Maccha Pichu, now in the Amazon, then to the Galapagos islands. Sarah and Nath just booked their trip.....Mexico,Guatemala, Belize, Porto Rico and hopefully Antilles Islands to visit our friend Lara in Bonaire, leave late Jan for 6 weeks. Amy ofcourse in BA early Sept to Dec 2012! And Ian at present sailing off the WA coast in the Ningaloo Reef with the dugongs. I lovelovelove hearing how happy and vibrant your lives are. Beautiful photos! ¡Qué suerte que dejaste registro de estas experiencias en el blog, que con los años cada vez está más lindo! Hermosas fotos y recuerdos.